A couple weekends back Dave and I celebrated our baby moon at Willows Inn on Lummi Island and I never want to forget that place. It was extremely relaxing, the food was delicious, and it was a perfect way to get time alone together before we become three. Just a heads up that there a TON of photos coming your way, I’m going to keep the descriptions to a minimum (the photos really do speak for themselves). We arrived on Friday, checked in, and made our way to our room. We stayed in the “Cottage,” which is quite aptly named as it is essentially a stand alone cottage. In the lobby they had a bunch of snacks and beverages for guests to grab and munch on, so we made some plates and ate them while enjoying the view from our porch. After our refuel we headed down to the beach that’s in front of the Inn and walked a bit. We were so lucky with the weather it was sunny the whole weekend! That night we grabbed a bite at the Beach Store Cafe (really good food – we determined that you would have to be if you were one of three restaurants on an island that included Willows Inn) and brought it back to our cottage. We started off Saturday with a beautiful hike. The first part of the hike included almost ALL the elevation gain, which was a little difficult, but the views along the way were worth every difficult breath. Pregnancy is so weird, you can complete an hour long spin class and not feel breathless, but try walking up a hill or stairs and man. Once we got to the top we saw a Bald Eagle fly by, it was awesome. Back at the room it was time to get ready for dinner. The eating area is beautiful! That was the last dish before heading to our tables so I wandered around and snagged some photos. The area where they grill/smoke. This was definitely our favorite, and Dave was in his happy place. Grilled geoduck clam and cured pork. Herb tostada (Dave’s had an umami puree and mine had a mustard greens puree – both amazing). Dungeness crab soaked in pinenut milk. Black cod and currant leaves. Bread from heirloom wheat and pan drippings. Everyone was in need of a little break so we all got up and walked around, took some photos and enjoyed the views. We were then given a palate cleanser made of toasted birch branches, it reminded me of the spa. Pears, pumpkin seeds, flax seeds. On the way out they gave us more of their house made bread to enjoy later. Everything about the meal was perfect and delicious. We are excited to go back during a different season. We had massages in the afternoon on Sunday so we pretty much spent the whole morning relaxing in our cottage. We may or may not have had an easter egg hunt. After our massage we went on another hike and then walked along pebble beach. On our last day there we enjoyed the pre fixe breakfast that they do at the Inn. It started with yogurt, apple, pear butter, and granola. 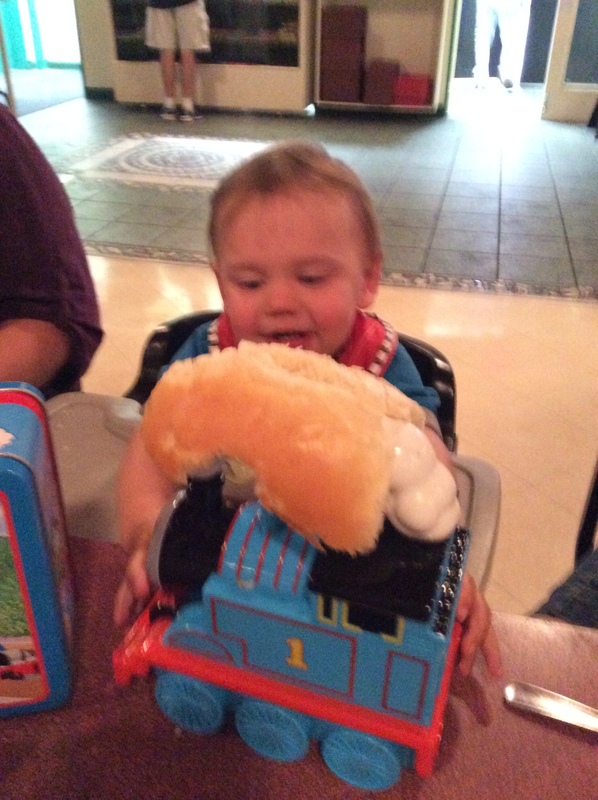 I’m sorry for the upcoming blurry picture, but it was the best part of the meal so I have to include it. I think I was just so excited to eat I rushed the picture hehe. Buckwheat crepes, sautéed kale, radish with creme fresh, bacon, salmon, prosciutto, cheese, honey, soft boiled egg. And then it was time to head home. We enjoyed our stay so much, but we were ready to get back to our boys and home. Such an amazing weekend, I highly recommend you visit! I’ve received some results from the biopsies and in a nutshell I could have 1 of 5 different things going on. First things first, none are life threatening; however, because we can’t pin point the disorder, we really can’t know how it’s affecting other areas of my health. I’m telling you MORE RESEARCH needs to be done in the digestive health arena in order to be more definitive in diagnostics!!! I do have an appointment with an allergist, and it happens to be on day 29 of the whole 30. All I can say is if he puts me on a more strict elimination diet I may punch him. Jk, but seriously tho. I’m also on a couple of medications for the next two weeks, to see if I can stop feeling pain/bloating. That parts a little frustrating, I read all these Whole30 success stories and they are all like, “5 days in and I am not bloated at all anymore,” I actually did feel better during the first 5 days, but then it went right back to my usual pain/bloat. So because of these symptoms and the lab results I have decided to stick to the Whole30 low FODMAP foods. I had lot’s of adventures in fooding this week and I figure rather than go day by day I’ll share them with you based on meal. Kale, sweet potato, and egg. Chia pudding by the pool. More kale, sweet potato, and egg + strawberry. Sweet potato “toast” with eggs and avocado. Nori wraps – this definitely filled the void of sushi hand rolls. Salad – this was the first day I felt like salad, it’s been so weird because I have always loved/craved salads but as soon as I started Whole30 I was like, ‘uh uh no way, no thank you salad man!’ But this one was delicious! Kung pao shrimp spaghetti squash. Work lunch – sweet potato wedges, carrots, plantain chips, olives, blueberries and the picture below. (work lunch continued) endive leaves with tuna protein salad. Well those were the ones I thought were the best (orrrrr the ones I remembered to snap photos of). I’m going to try and be better about taking pictures of what I eat, so I can share it with you guys. I used a modified version of this recipe so that I wouldn’t waste any of that cashew goodness after I had made cashew milk. 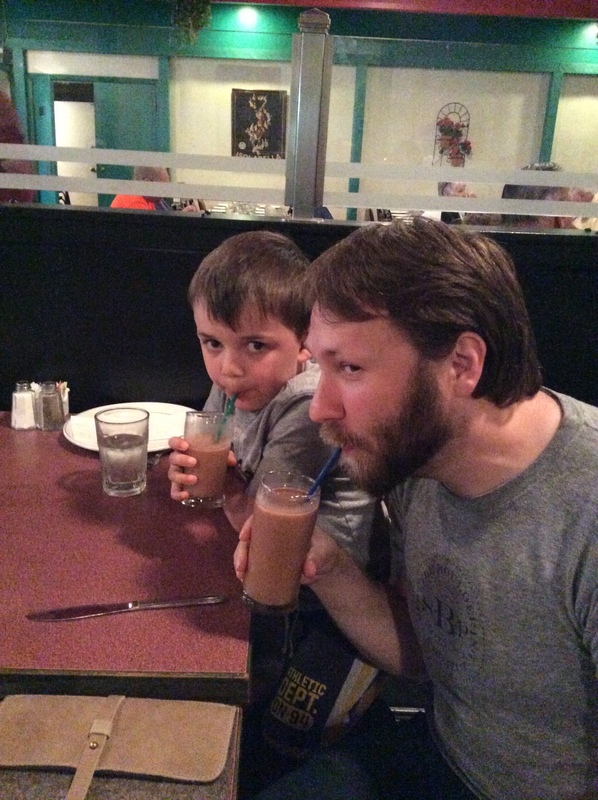 We decided that overall we like the almond milk better, it’s just creamery and that wins for us. At first the stomach pain and bloating had subsided, but in all honesty it has returned full force. I do feel as though I have more energy and can exist without a cup of coffee. Still having cravings for my favorite treats, but that has definitely died down. That’s all for this week. Have a wonderful weekend! I haven’t shared on the blog about the many digestive difficulties I’ve had throughout my life. This is mostly because I hate when people talk about their ‘food issues’/intolerances when it hasn’t been asked for. But, as this is such a big part of my life, and ultimately a major health issue I’m going through right now I thought I would divulge. It all started when I was really little. 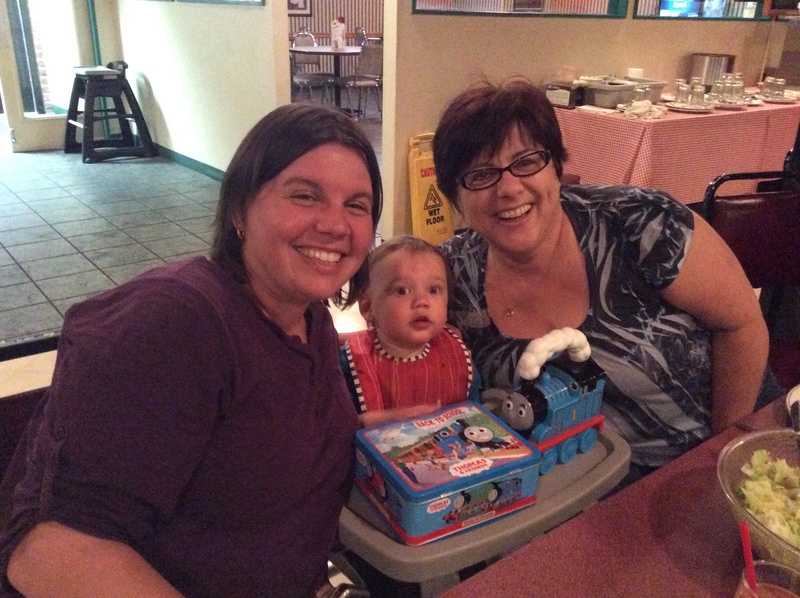 When I was a baby my mom would feed me and directly following I would cry and cry and cry. I won’t go into too many details, but since then my life has been fraught with digestive upset leading to nights of severe pain and difficulty sleeping. At certain points in my life I could pinpoint the upset to dairy, but as time has gone on there is no clear connection. I’m still trying to get to the root of many of these problems, and one way was to test for allergies. I’m happy that there seems to be more money allocated to research in digestive sciences, but in all actuality it’s still not great. There are blood tests for allergies, but they often provide false positives. Doctors have what are called “food challenges” and those have been found to be fairly accurate when identifying allergies and intolerances. The challenges consist of ingesting the food that your concerned there is an allergy or intolerance toward and if there is no reaction, gradually increase the amount, if there is no reaction you are declared allergy-free. Now graduate school created in me some OCD and scientific tendencies that lead me to do certain things in my life with as much structure as possible. Because I see the flaws in the ‘food challenge’ described above, predominately the fact that you may have ingested other foods recently which could be causing the reaction, I have decided to embark on a more structured ‘food challenge.’ After much research, the Whole30 is the way I’ve decided to go. I’m in the process of ruling out any major ailments through medical procedures, but I know that if there is something medically wrong, then the Whole30 won’t hurt. I’ve already done some food prep from the Whole30 book, I made my own ketchup and mayo, as well as a frittata (recipe to come). I do feel a little nervous/excited. I’m nervous because I’m very much a moderator, and I love occasional treats….donuts 🙂 Whenever I withhold food I’m taken back to a bad time in my life when I had disordered eating. Because of this I’m going to proceed with caution and analyze only to a point that is enjoyable and rewarding. I am very excited as well because I feel the Whole30 staples are in line with many of the foods I already enjoy eating. My goal is to do weekly recaps on the blog, both to assess my progress (specifically how my stomach is feeling) and to maintain some accountability. I also plan to share some of the recipes that I create during the program. Hope you enjoy! I’ll admit it, I love seeing a glimpse into the daily eats of the bloggers I follow. I’d love to know the psychology behind my interest in knowing what people put in their face holes, but alas all I can tell you is that the curiosity runs deep! I also think I just like looking at food, putting it in my mouth, and taking pictures of it. So it seems the logical next step would be to share them with you, here are all the things I ate yesterday. A burrito was involved, so yup, it was a good day. The day started off with a massive glass of water along with a piece of toast topped with a fried egg, avocado, and chipotle salsa. I made Dave a smoothie and my OCD makes me feel like I should only put 15 almonds in it, so I had these three left over in my hand that I needed to eat. I was in need for a mid morning snack so I had some peaches and soy milk topped with unsweetened shredded coconut. And because I can’t let anything go to waster, I threw some of my honey almond butter granola into the left over soy milk. I’m not gonna lie, I felt snacky all day, so I grabbed some Beanitos and salsa/cottage cheese mixture. Once dinner rolled around it was decided that we needed burritos in our bellies. Perla’s Taqueria is auh-mazing! We still haven’t checked out taco Tuesday (though we hear it’s great), but the chipotle fish burrito is to die for! Good day of eats, I hope you enjoyed. Also, I hope you thoroughly feel as though you need to go get a burrito!!!!! I think I’ve mentioned on the blog before that Dave loves to cook, and when this guy cooks he goes ALL out! The other day he told me he was going to make Uovo en raviolo, and so naturally I said, “awesome, I’ll invite my friends and you can make it for all of us.” He freaked out a little bit, but he took it on like a champ. He used this recipe, and he had a stroke of genius when he substituted pistachios for the pancetta (gotta love a great cook who can be clever with recipe modifications). The first thing he did was prepare the dough. He made a beautiful egg well. Then we went for a bike ride (needed to work up an appetite). By the time we got back we needed something to snack on while Dave got things going, so in true Italian fashion we had some rosemary bread dipped in oil. Dave called upon his sous chef, and I assisted with the dough. I’m gonna drop a little Italian knowledge on ya, you ready for it? ‘Raviolo’ is the singular of ‘ravioli,’ and the reason this recipe uses that form of the word is because each raviolo is gigantic and you’re really suppose to have one in a serving. The filling consists of a ricotta/parmesan mixture and an egg yolk. There were definitely some tricky steps in the recipe that were good learning experiences for the next time we make them. You should flour the parchment paper that you put the ravioli on, because if you don’t, once you’ve sealed them they will surely stick to the parchment paper. While I assembled the ravioli, Dave prepared the sauce. Each raviolo needed to be sauced. Of course we had some beggars, always hoping a scrap of something will fall to the floor. They’re so cute it’s hard to ever stay mad at them. The other night I made French Onion Soup and man oh man was it aaamazing (if I do say so myself). I wanted to share with you all the order of operations and the edible images (well some of them) that I captured. I’m waiting until after the wedding (25 days!!) to purchase myself a nice camera. I’m gonna take that thing all over Japan, and then share all the beautiful images with you! But I digress. I used Tyler Florence’s recipe because it was the first one that popped up on my google search which sounded delicious, wooow that sounded super lazy. Well let me tell you, making this recipe was anything but lazy. After that you add onions, garlic, bay leaves, thyme, and salt and pepper. Cook for roughly 25 minutes, or until onions look all caramelized and shiz. I’m gonna tell you the honest to goodness truth, I sometimes don’t use red onions because I don’t think they’re very pretty. This time I used them because it was all I had, and honestly, who cares? After this you add red wine and bring it to a boil. Reduce to a simmer and cook until all the liquid is gone, or about 5 minutes. Then remove the bay leaves. Dust the onions in flour and give them a stir (yup that’s Dave’s hand, he’s a good sous chef). This is my first time adding flour, and I think it really made an amazing difference. Turn the heat down to low and cook for 10 minutes to cook off the raw flour taste. Now add the ‘better than bouillon’ fake beef broth bring to a simmer for about 10 minutes and add salt and pepper to taste. Now when it’s time to eat preheat the broiler. I like to place a slice of french bread on top of the soup (in an oven safe bowl) and add a slice of provolone. Then place in the oven for 3-5 minutes. I was really happy with how it turned out. Another nice thing about this soup is that it tastes just as good without the bread and cheese and is roughly 80 calories per cup! 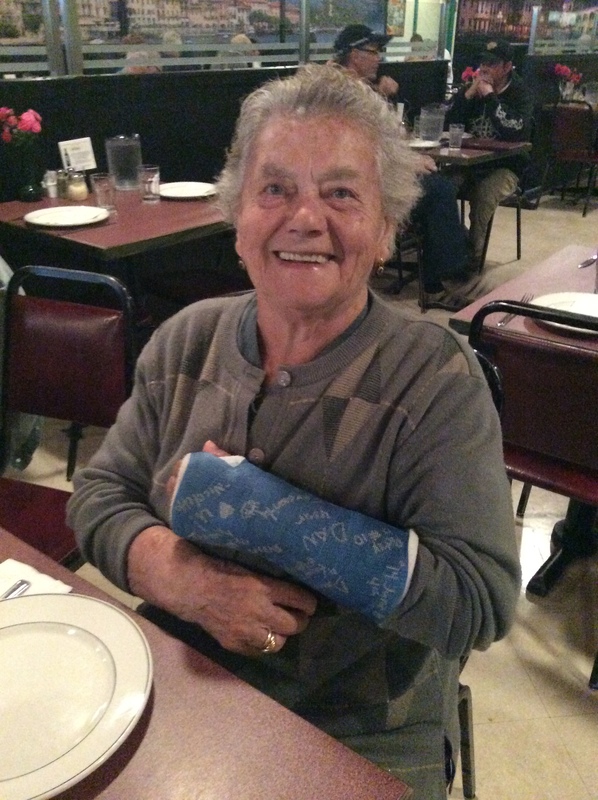 Okay so when nonna is out of commission (aka broken wrist), we have to FORCE her to not do anything. It’s cute cause she just can’t stop herself. We decided that we needed to get her out of the house for din din, otherwise she’d try to make us a five course meal. 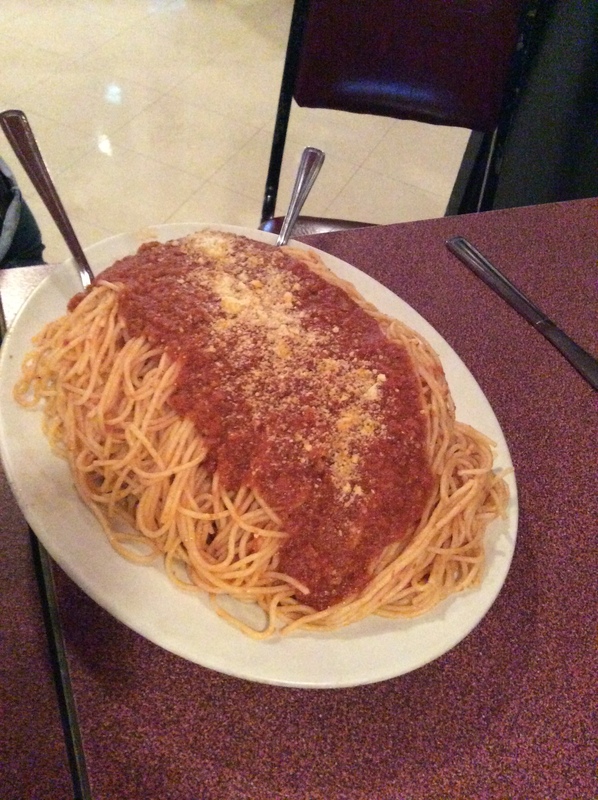 Sooo much pasta and sugo!!! 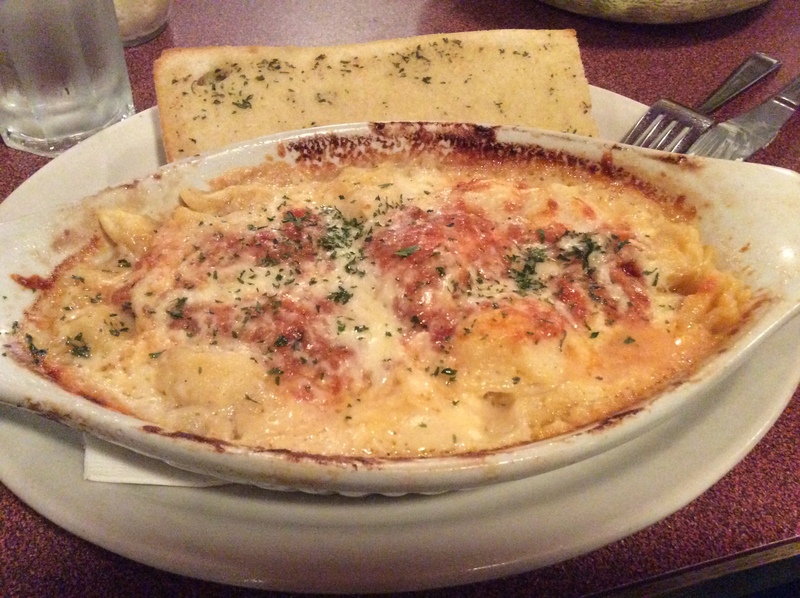 Baked tortellini = cheesy delicious amazingness. 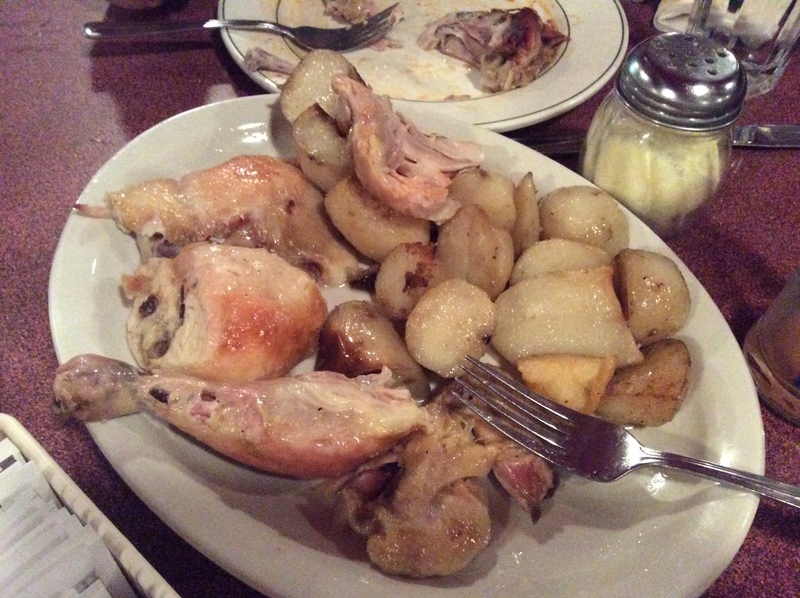 Meat and potatoes (the potatoes weren’t as good as nonna’s, but then again nothing really is). 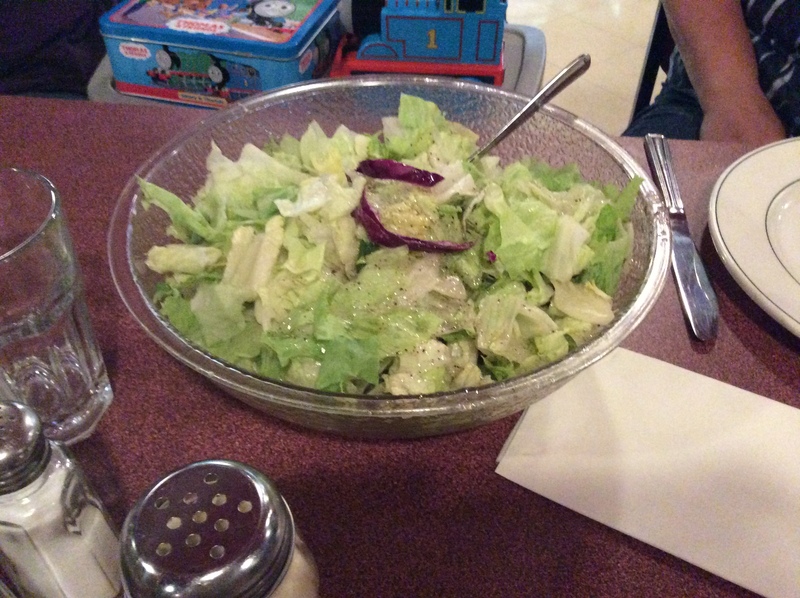 In true Italian fashion you FINISH your meal with the salad. Logan made a Thomas sandwich!!! 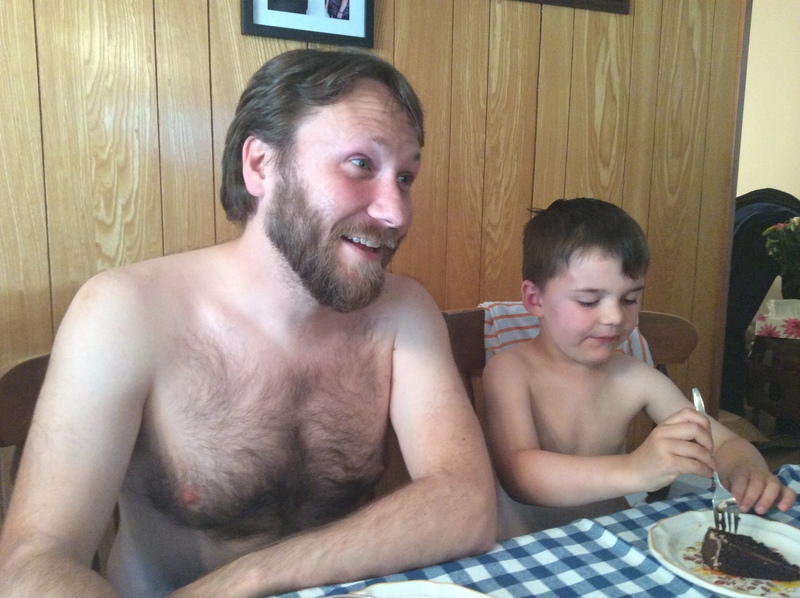 Chocolate cake needs to be eaten without a shirt (incase of spills), that rule is for Dave as well.